The origins of Plymouth can be traced back to Saxon times, more than a thousand years ago, and its history very much reflects its maritime location. With many famous figure links and great historical moments, we have created this itinerary so that you can get the most out of Plymouth's rich history. 10am: Make your first port of call the historic Sutton Harbour setting off The Barbican to watch the comings and goings of boats. Wander the ancient cobbled street – little changed from Elizabethan times – and browse the shops and galleries. Whilst you're here visit the Elizabethan Gardens and neighbouring Tudor Tea Rooms on New Street or Plymouth Mayflower Museum, in the Tourist Information Centre, which houses an exhibition on the city's history on the voyage of the Mayflower to the New World, with experienced staff on hand to provide further information. 11am: From the Tourist Information Centre wander across the road to the Mayflower Steps (please note that the Mayflower steps are currently closed for restoration and repair ahead of the 400th anniversary commemoration year in 2020) where in 1620 the Pilgrim Fathers embarked on the Mayflower voyage to the Americas. Take a picture and stop for a drink in the stunning setting of marinas and cobbled streets. Lunch: Just past the Mayflower Steps you'll find the Barbican Landing Stage where a short water taxi ride will take you across Plymouth Sound – with stunning views of the city from the sea – to Royal William Yard, a former victualling yard for the Royal Navy. Open to the public, Royal William Yard is home to a fantastic range of cafes, bars and restaurants. 2pm: Take the water taxi back to the Barbican and head to the Plymouth Gin Distillery for a Gin Tour where you can see how the world famous tipple is made and enjoy some tasters. 3pm: Exit the Plymouth Gin Distillery onto Southside Street and explore the fabulous shops, boutiques and galleries that line the cobbled streets. The antique shops on New Street are well worth a visit, with a mesmerising collection of curios artefacts and collectables all for sale at the right price. 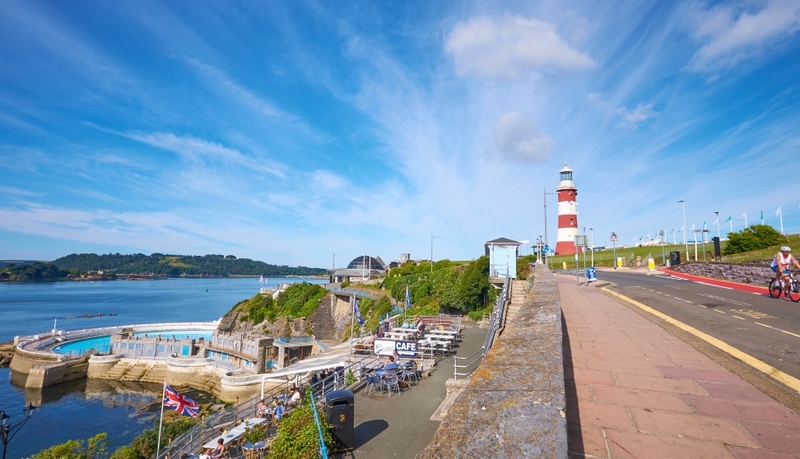 4.30pm: From the Barbican you are just 5 minutes walk away from the stunning Plymouth Hoe, the city's waterfront park. The Hoe is the heart of the city an offers breathtaking panoramic views across Plymouth Sound over towards Mount Edgcumbe and the Cornish coast. The tended gardens of the Hoe are home to the iconic Smeaton's Tower Lighthouse and the Royal Citadel, home to the Royal Artillary – both open to the public – as well as the city's war memorials and the famous green where Sir Francis Drake played bowls awaiting news of the Spanish Armada. Dinner: Plymouth is a food lovers delight – cooking with fantastic locally sourced produce in restaurants in stunning locations. For fine dining try the award-winning Barbican Kitchen run by local celebrity chefs Chris and James Tanner, located in the Plymouth Gin Distillery or try the Greedy Goose located in the Prysten House, one of the oldest buildings in the city – exquisite food in a wonderful atmosphere setting.